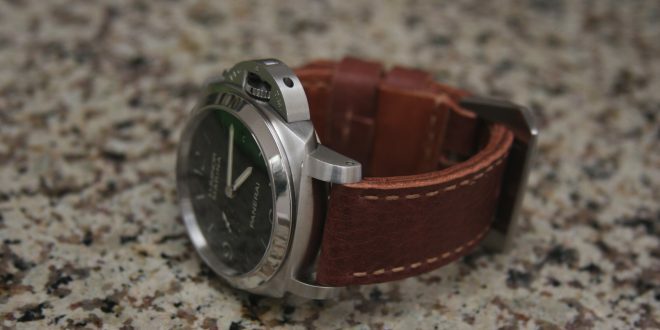 My constant desire to find the next strap to add to my Panerai custom strap collection took a nice turn when I found Mike of Salvadore-09 straps on Instagram. With social media booming at it’s peak, Instagram has become a great medium for companies to get their work noticed by the masses all around the world. It apparently worked because the straps that were featured on their Instragram got me wanting to see these things in person. As you might have already read, we did an interview with Mr. Salvadore-09 himself, Mike. You can find the interview here . After a few emails with Mike we decided on a few straps that he would send over my way and this is the first of a series of reviews from this new strap maker who is perfecting his craft with love. When I first took this strap into my hands I was very surprised by the soft texture of the strap. Not only was the actual texture on the main part of the strap nice but the underside was as smooth as a babies bottom. I couldn’t wait to get this mounted on my PAM312 and see how it felt against my skin. I would say the strap itself is a great thickness right between the thicker ammo straps and an OEM MX strap. The strap itself is soft enough where it won’t need a breaking in period and can easy molded around your wrist with comfort. 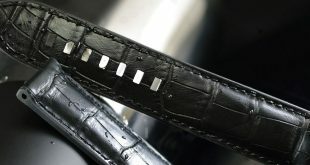 The underside of the strap features a separate layer of leather that is very smooth to the touch stamped with “Genuine Leather” on the buckle side and on the other side “S-09 Handmade”. I like the idea of the extra layer of thin leather on the bottom which not only gives it a level of comfort but also gives it a beautiful polished finish of a higher price point strap. The stitching on this strap is a nice golden golden color that accents the strap very nicely. For a strap maker that does this for a hobby and the occasional sale he did a superb job of get a clean stitch all the way around. The buckle side features a dual keepers system with one fixed and one floating keeper much like the OEM panerai straps. Be aware that some of Salvadore-09 straps do not come with buckles or tubes so you will have to pay extra for those items. I can tell right off the bat that this strap is going to be comfortable to wear for hours on end. It definitely will not need a break in period thanks in part to the soft underside as well as the overall flexibility of the strap itself. You want to continuously rub your fingers over the surface of the strap to enjoy every inch of this handcrafted beauty. Based on my inspection of the strap I feel that this strap will hold up nicely to everyday wear. The glueing, stitching, and overall finish of the strap indicates a dedication to quality. For being a newer strap maker on the market he has done a good job of understanding where to concentrate his efforts in creating a great strap. Only time will tell how the straps handle the riggers or use but I think we will be in it for the long haul. Some of the stitches seem to be offline or a different size but are very subtle unless you get up close. Salvadore-09 straps has a number or ready made straps for purchase at http://www.salvadore-09.com. Or if you want to get a custom one you can contact the directly to make a strap to your specifications.